I like the way that Smitten Kitchen archives her posts so you know exactly what she made a year – and two years -before her post. If I were organized enough, I’d post what I thought my menu would be a week before executing it. I typically have grand ideas for dinner party menus but when it comes down to getting the job done I’ve been getting pretty slack. For my Lady Gaga party I wanted to make mini paninis with pulled short ribs, stinky cheese and pickled red onion (I’m drooling just thinking about!) but I had zero time to get all the ingredients together. Who has time to slow cook short ribs and pickle onions by Wednesday after a full days work? Not this working girl! 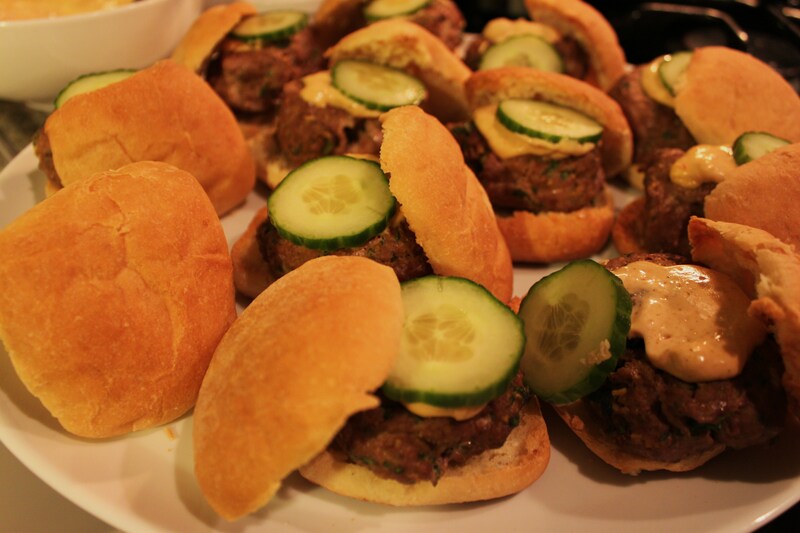 Luckily, I had bookmarked this recipe for Bombay Sliders on Epicurious.com. They are delicious, easy (love the broiler but grill will work too on these sunny days) and came together in the midst of my squirrel fiasco. I had to skip a couple of the garnishes because squirrel paws landed all over them – but I don’t think anyone noticed. Mix 3/4 cup mayonnaise, 2 1/4 teaspoons curry powder, and next 3 ingredients in small bowl for sauce. Let stand at room temperature while preparing sliders. Place turkey, next 6 ingredients, remaining 1/4 cup mayonnaise, and 4 teaspoons curry powder in large bowl. Mix with fork or hands just until blended (do not overmix). Divide mixture into 12 equal portions. Using wet hands, form each portion into patty about 1/2 inch thick. Preheat broiler or heat 1 tablespoon oil in heavy large skillet over medium-high heat. If broiling patties, brush rimmed baking sheet with 1 tablespoon oil and arrange patties on sheet. Broil (or cover patties in skillet and cook in batches) until cooked through, pressing patties down lightly with spatula before turning over, about 3 minutes per side (or 4 minutes per side if cooking in skillet). Place patties on bottom halves of rolls. Top each patty with sauce. Cover with roll tops. Place 3 sliders on each of 4 plates and serve.